Florida has a regular smorgasbord of invasive and exotic species, from walking catfish and snakeheads to 6-foot iguanas. One of the more troubling invaders is the Burmese python, which is found throughout Everglades National Park, Southern Glades Wildlife and Environmental Area and adjacent areas. They’ve also been spotted in Big Cypress National Preserve and Collier-Seminole State Park. Most of them are between six and 10 feet long, but one has been recorded at more than 16 feet—and 100 pounds. Although wildlife biologists don’t have a good count of how many snakes are out there, records indicate that about 112,000 of these snakes have been imported into the United States since 1990. Under current regulations, only properly licensed dealers, public exhibitors and researchers may purchase them, but individuals who already owned them before July 1, 2010, are permitted to keep them as long as they maintain a valid Reptile of Concern license. The Burmese python represents a significant threat to native wildlife. Photos that circulated on the Internet a couple of years ago showed one trying to eat an alligator, so they won’t hesitate at going after a deer or other mammals. In 2013, the Florida Fish and Wildlife Conservation Commission (FWC) reached out to hunters via the first Python Challenge competition. Between Jan. 12 and Feb. 10, 2013, hunters and other individuals who registered for the competition took to more than a million acres of south Florida swamps to harvest Burmese pythons. Almost 1,600 people from 38 states, the District of Columbia and Canada registered for the competition, and participants brought in 68 Burmese pythons. Rewards for successfully bringing in a python were considerable. The grand prize for harvesting the most pythons was $1,500, and the First Place prize for harvesting the longest python was $1,000. 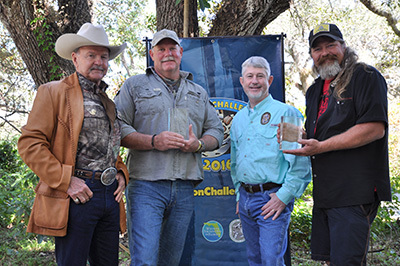 The FWC held another Python Challenge in 2016. This time participants brought in 106 snakes. Rewards went up, with a $5,000 grand prize for the team capturing the most snakes and a $3,500 grand prize for the individual capturing the most snakes. The team that caught the longest snake received $3,000, and the individual that caught the longest snake won $1,000. Besides these designated Python Challenge events, the FWC has opened an official year round season on Burmese pythons and encourages hunters to harvest them from 22 FWC-managed areas. Hunters are not permitted to remove the snakes from these areas alive unless they have a Python Removal Permit, but they may sell the skins and meat. Recently the FWC has gone even further in its effort to control pythons. Its new Python Removal Contractor Program pays contractors an hourly rate to hunt pythons, and then pays for the snakes by the foot. The University of Florida (UF) is also contributing to the effort to reduce the number of pythons in south Florida ecosystems. During the time of year when Burmese pythons are breeding, researchers have found that radio-tracking a single python can lead them to more snakes that they can capture. Burmese pythons live a normally solitary life, but from December through April in southern Florida, they gather in groups of up to eight, providing an opportunity to capture them in numbers. The FWC conducts Python Patrol Workshops around south Florida. This no-cost training program is designed to create a network of trained individuals throughout south Florida who know how to identify Burmese pythons, report them and sometimes capture and remove them.